In March 2010, news sites were abuzz with the announcement of a proposed Chinese-backed high-speed Eurasian rail line that could whip passengers between London and Beijing at speeds of up to 345 km/h (215 mph), completing the 17-country, 8 160 km (5 070 mi) journey in just two days. While such a fantastical project is likely decades away, completing such a long trip exclusively by train is not. In fact, you can make an even longer trip right now and never leave the train except for switching cars. The catch, of course, is that it will take you much longer than just two days (and probably cost you a fair bit in the process). The longest single uninterrupted train journey, including transfers, does indeed stretch beyond London and Beijing. Starting from the Portuguese coast, one can travel by train not just into China but all the way to southern Vietnam, a distance of 17 000 km (10 566 mi). Starting in Portugal at Porto, the first two days of this trip is (relatively) simple, as all of the countries one would travel through are members of the European Union, and all but Poland are covered by Eurail, a consortium of rail carriers which collaborate in selling tickets. While this ensures some level in coordination in travel, and a Eurail pass can grant free access to much of the route, supplemental travel and reservation fees still apply to most high-speed and sleeping trains. Using the shortest timetable, the distance from the coastal centre of Porto to the Polish capital of Warsaw can be covered in 40 hours and 33 minutes (including time zone changes) with just four transfers. From Porto, travellers would head one hour south along the Atlantic coast on a high speed train to Coimbra. After a one hour layover at Coimbra, a regular train heads east across the width of Portugal (very slowly, it must be said) before carrying northwestern Spain via Salamanca, Valladolid, and Vitoria-Gasteiz into France at Hendaye (reservations are compulsory on this trip which is seated second-class travel only). Once in France, it’s a transfer onto the TGV (but not the high-speed trains, which won’t ply this particular route until 2017) for a six-hour trip to Paris. An hour-long transfer on the Paris Metro takes you to the north end of the city, where a high-speed train carries you all the way toCologne in just three hours, stopping only at Brussels, Liege, and Aachen. It’s a three hour wait in Cologne before you can transfer onto the train heading eastbound from Amsterdam to Warsaw. The travel time from Cologne across Germany and Poland to Warsaw via Dortmund, Hannover, Berlin, Rzepin, and Poznan is ten hours, but at least it’s in comfort on a sleeping car. 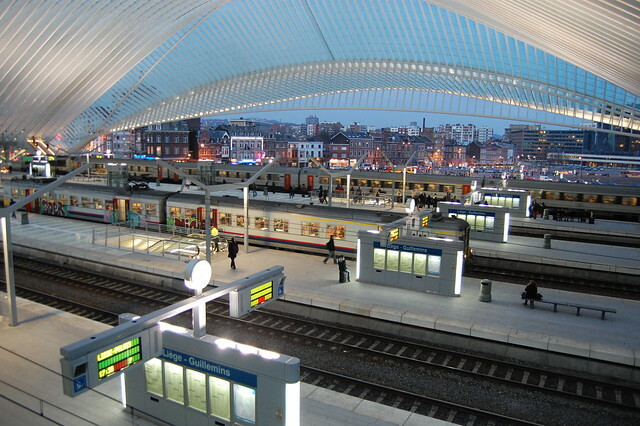 The TGV station at Liege. Source: A. Russeth, http://www.flickr.com/photos/sixteen-miles/4305065997/. Licensed under theCreative Commons Attribution-ShareAlike 2.0 Generic (CC BY-SA 2.0) licence. From Poland, travellers have two options: travel through Belarus, which requires a transit visa one must apply for in person that takes days to process; or take the slightly longer but more sensible option, which is to continue north through the Baltic states and then continue east to Russia, which would add a day and some euro to your bill but would remove some of the hassle. For the purposes of this entry, however, we’re only interested in the longest directroute possible by train, and the train through Belarus is the direct route. That trip will leave Warsaw at 22:45 and take over a day to complete. Incorporating two time zone changes, the long 1 311 km ride to Moscow takes 26 hours and 25 minutes. Make plans ahead of time for a day in Moscow, because it’s an 18 hour and 25 minute layover before you board the train that will take you almost to the Pacific Ocean. From Moscow, it’s a transfer onto the legendary Trans-Siberian Railway. But sticking with the premise of the longest possible direct route, this won’t incorporate a trip along the length of the mainline all the way to Vladivostok. Instead, after making an epic journey across the bulk of Russia via Perm, Yekaterinburg, Omsk, Novosibirsk, Krasnoyarsk, and Omsk, this train turns south at Ulan-Ude into Mongoliabefore arriving in Beijing six nights and 7 622 km after leaving Moscow. The Moscow-Ulan Bator-Beijing train is a comfortable ride, and rather inexpensive considering the huge distance involved at $804 for a berth in a 4-sleeper and $1 131 for a berth in a 2-sleeper. You will have to stop at the Mongolian-Chinese border for a four-hour wheel switchover as China’s railways operate on a narrower gauge than Russia and Mongolia. 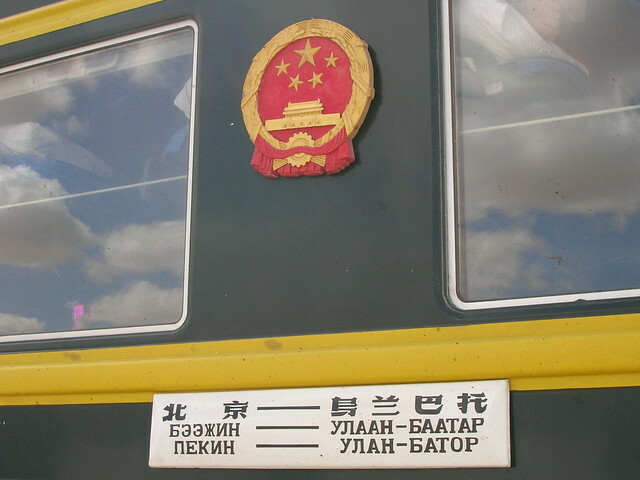 The Ulan Bator-Beijing Train. Source: Sistak, http://www.flickr.com/photos/94801434@N00/3067654452/. Licensed under the Creative Commons Attribution-ShareAlike 2.0 Generic (CC BY-SA 2.0) licence. From Beijing, the final leg of your cross-Eurasia journey begins. It will be somewhat of a rush to make it from Beijing Central Station to Beijing West to catch the train to Hanoi, but the opening of the Beijing Subway’s new Line 9 next month will allow you not to have to cheat by taking a bus. Travelling south via Zhengzhou, Guilin, and Nanning, there is a change of train at the Vietnamese border as Vietnam uses a one-metre gauge for it rail tracks. Hanoi is just over four hours from the border. 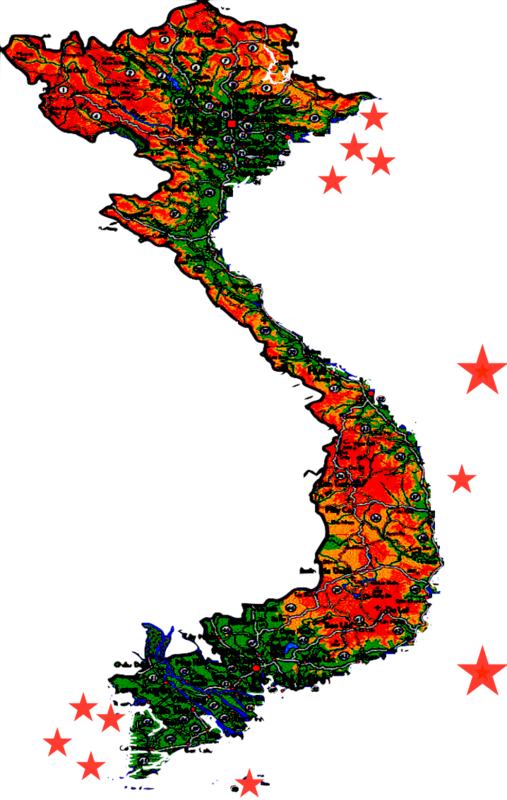 Once in the Vietnamese capital, it’s an eleven-hour layover before the 33-hour, 1 726 km (1 072 mi) trip to Saigon, Ho Chi Minh City, where you reach the end of your long ride. The ride across Vietnam is the cheapest, ranging between US$50 and $78 dollars for the entire length of the country, and because of the need to rebuild the entire rail system from scratch after the Vietnam War, the trains are rather new and pleasant. Source: M. Rijavec, http://www.flickr.com/photos/miran/2286187360/. Licensed under the Creative Commons Attribution-ShareAlike 2.0 Generic (CC BY-SA 2.0) licence. All told, the 17 000 km (10 566 mi) journey takes 327 hours, including time zone changes. That’s over 13-and-a-half days. Going the express route, you might be able to pull it off for just over US$2 000, and you may still be able to book first-class for US$3 400 (but take those figures with a grain of salt since everyone from travel agents to local authorities to amenity providers will be sure to add to the final total). Below is a sample itinerary compiled from timetables of the various local rail authorities. Who’s up for a trip? All prices were hastily sourced from various travel sites. They are shown for descriptive purposes only and should not be considered exact. Always be sure to research fares extensively when travel planning. Moore, M. (2010). King’s Cross to Beijing in two days on new high-speed rail network. The Telegraph, 8 March 2010. Available at http://www.telegraph.co.uk/news/worldnews/asia/china/7397846/Kings-Cross-to-Beijing-in-two-days-on-new-high-speed-rail-network.html. Accessed 27 November 2011. Simpson, P. and D. Wilkes (2010). Orient super express: From London to Beijing by train… in just TWO days. Daily Mail, 9 March 2010. Available at http://www.dailymail.co.uk/news/article-1256536/200mph-train-link-London-Beijing-just-days.html. Accessed 27 November 2011. Smith, M. (2011). How to travel by Trans-Siberian Railway from London to China & Japan. The Man in Seat Sixty-One, 16 November 2011. Available at http://www.seat61.com/Trans-Siberian.htm. Accessed 28 November 2011. Way to Russia Guides (2009). The Best Train Routes to Russia with Timetables, Prices, and a Map. Way to Russia, 14 August 2009. Available at http://www.waytorussia.net/Transport/International/TrainSchedules.html. Accessed 27 November 2011.